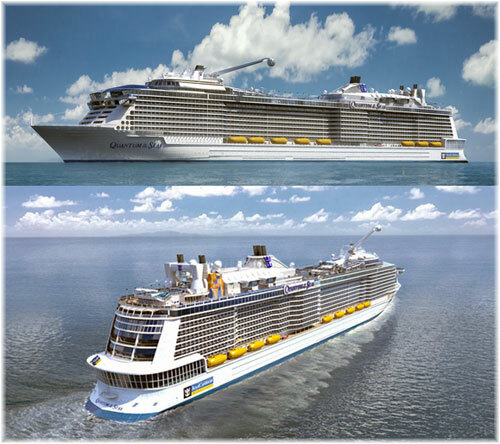 Royal Caribbean has announced that it will base its second 167,800-ton “Quantum” class cruise ship, Anthem of the Seas, in the UK from 2015. Interestingly, she will be a fifth larger than P&O Cruises’ new 141,000-ton flagship Britannia, due to debut in the same year. She will be Royal Caribbean’s latest contribution to the head-on-head battle for supremacy in the UK market from Southampton between Royal Caribbean and its Celebrity brand, on the one hand, and Carnival UK, with its P&O and Cunard brands, on the other. Elsewhere, Oceania Cruises has now scheduled two 180-day world cruises for its 30,277-ton Insignia, making her a year-round world cruiser. And we have a quick look at what’s happening on P&O Cruises’ blog. From the observation level of the 46-storey Heron Tower in London, Royal Caribbean International recently announced that its 167,800-ton Anthem of Seas, second of its new “Quantum” class ships, will be based in Southampton when she joins the fleet in 2015. One of the themes of the presentation was anthems, of which the UK has more than its fair share, with the National Anthem, Land of Hope and Glory, Jerusalem and of course the naval anthem Rule Britannia, as well as the European anthem, Beethoven’s Ode to Joy. Certainly the name Anthem of the Seas will go over a lot better in the UK than the 154,407-ton Independence of the Seas, which she replaces, which seemed like a mild dig to remind the UK of America’s own declaration of independence. The new ship, able to carry 15% more passengers than the Independence of the Seas, will join the other Royal Caribbean and Celebrity ships at Southampton in the battle for the UK market. The Anthem of the Seas will be about a fifth larger than P&O Cruises’ new Britannia, almost 60 feet longer than the new P&O flagship and will carry 580 more passengers. On this note, the Independence of the Seas was also larger than the Britannia. Equally, Royal Caribbean’s second Southampton-based ship, Adventure of the Seas, is about a fifth larger than P&O’s Azura, with about 70 feet more length. After the addition of 75 new cabins in April 2014, she will carry 168 more passengers than P&O’s second ship, but will still offer 13% more space per passenger. The Anthem will offer Mediterranean cruises from Southampton from April 2015 and will be based in the UK for the summer months before moving to Fort Lauderdale for the winter. She is expected to carry more than 80,000 passengers from Southampton in 2015. The Anthem will also have several shipboard firsts, including a skydiving attraction and the North Star capsule, which will be based on the pods on the London Eye and will be able to raise passengers 300 feet over the ocean. A music hall and new bar will also come with the new ship, with the former to host intimate live performances and disc jockey sets. Inside, the ship will have bumper cars and roller-skating as part of a larger sports complex, while its staterooms will be larger than previous Royal Caribbean ships and inside cabins will include “virtual balconies” on screens. During Oceania Cruises’ first ten years, it has sailed to all corners of the world. As destination specialists, the line earlier this year announced the journey of a lifetime, a true world cruise in the 684-berth Insignia that will circumnavigate the globe, with a 180-day world cruise from Miami on January 10, 2015. 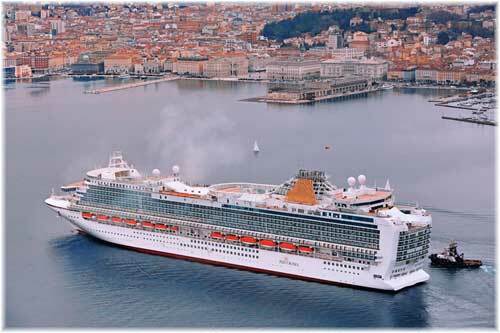 But Oceania decided to do it their own way, saying that a world cruise is not a race, it’s journey. They must have known what they were talking about for as soon as the cruise was released for sale it sold out in about eight hours. So successful has this cruise turned out to be that Oceania Cruises has now said it will schedule a second 180-day world cruise in 2015, immediately after the inaugural circumnavigation returns to Miami. The Insignia will leave July 8, 2015, and visit 100 ports of call, starting in New England and Canada. The unusual summer start will allow for a unique global itinerary. Included in the voyage are overnight stays in 14 cities ranging from Abu Dhabi to Walvis Bay. On embarking in Miami’s July heat, the Insignia will head north for a change to cooler weather, to Canada and New England and then across the Atlantic via Greenland and Iceland during the summer’s endless daylight. She will visit many iconic ports in the Mediterranean before making many multiple-day stops in Asia, such as Mumbai, Rangoon, Singapore and Hong Kong. Overall, her second cruise will feature 14 overnight stays. From there it’s off to explore Africa from Kenya to Cape Town and the continent’s western shores, before concluding the voyage with a holiday season of island-hopping in the West Indies on the way back to Miami. The Insignia is sailing at the moment as the Columbus 2 for Hapag-Lloyd Cruises. Under this name, she is presently sailing a 176-day round-the-world voyage from Barcelona to Barcelona. Perhaps it is from here that Oceania got their idea of offering a much longer world cruise. Presently Columbus 2 is in Richards Bay, bound for South America and then the Pacific Ocean to Australia, the Far East and the Middle East before finishing in Barcelona on April 21. 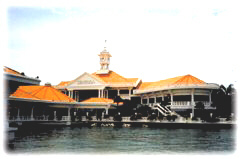 There, she will redeliver to Oceania Cruises. A quick look at P&O Cruises’ blog at discoverpocruises.co.uk gives us some interesting feedback as to how it sits in the market with its own customers. After a brief introduction for Christopher Edgington, P&O’s new marketing director, he answers a series of questions and complaints from customers about pricing, service, cutbacks, entertainment and customer service while handling complaints. At least by publishing these queries and complaints, P&O looks like it is being honest. On analysis, the results probably show that P&O Cruises has a much better product than it thinks it does, judging by the reactions of its clients, who seem to care. If only it could stop trying to trick its customers on pricing (see The Cruise Examiner, June 17, 2013, “P&O Cruises Stung In The Tail By Vantage Fares”) and other matters and be more honest with them than it has been. And if only it would do the same with agents, who have been derided with 5% commissions, despite a new program called Agent Matters mounted in July. Agents’ boards are full of complaints as well and the two lines have a long way top go to get back to where they were. In all this, David Dingle remains as ceo of Carnival UK, which includes P&O Cruises and Cunard Line, and now also formally acts as chief executive for the two brands. From reading the online exchanges, It seems that the lines could learn to communicate more effectively and clearly with both customers and agents. Let’s hope this latest blog posting is a start but it will be interesting to see how the new teams cope in the ongoing battle for market share with Royal Caribbean whilst trying to keep fares up to a contributory level.